March 11-17 is Global Engineering Week! Global Engineering Week (GE Week) will challenge students at U of T Engineering and across Ontario to think critically about how they can make a difference on the world stage. Complex global issues — from climate change to accessible health care — affect all of humanity. These challenges require multidisciplinary teams of engineers who can think beyond the technical aspects of the problem, says GE Week founder Malik Ismail (EngSci 1T6 + PEY). Morris Huang, Year 3 MSE, is one of the passionate engineering students planing the GE Week events at U of T including a speaker panel on the role of artificial intelligence in global development and a student hackathon, Hack the Globe, which kicked off on March 2 and will continue March 16-17. 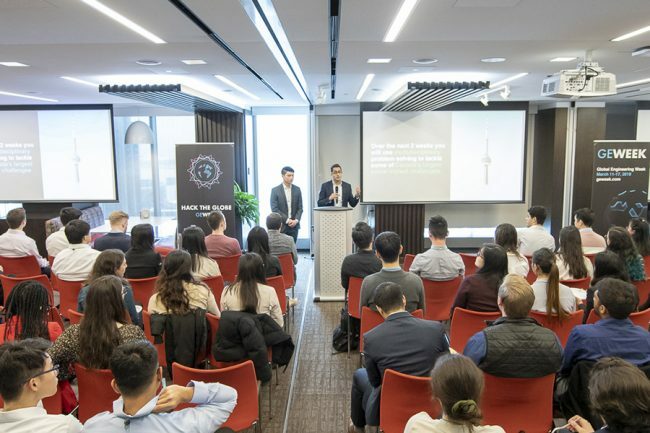 “The hackathon is the first social-impact hackathon of its kind in Canada and emphasizes multidisciplinary challenges outlined in the Google Impact Challenge,” says Ismail. Participants include students from engineering, computer science, business, health sciences and the arts. GE Week events has also expanded to three other universities this year: University of Waterloo, Concordia University and Western University. ← MSE research group is one of the 12 Semi-Finalists of the Crush It! Challenge.